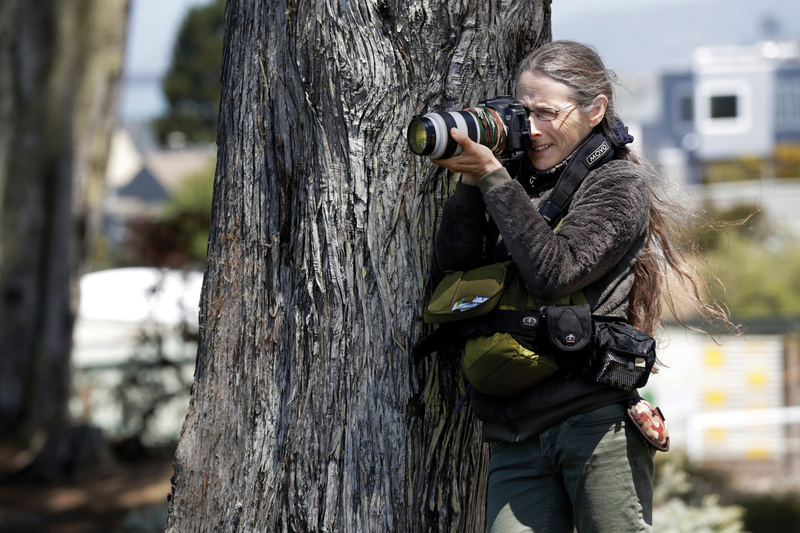 An amateur naturalist, self-taught urban wildlife photographer and longtime resident of San Francisco, Kessler, 65, has spent the better part of the last decade tracking, studying, documenting, and generally enjoying the heck out of her favorite neighbor, Canis latrans. She spends a minimum of three hours a day, usually at dawn or dusk, checking up on individual animals and family packs. By her estimate, several dozen coyotes live in the overgrown chinks in the metropolis’ concrete armor: “McLaren, Lake Merced, Golden Gate — they’re in all the parks.” This golf course, sandwiched between a neighborhood known for its Chinese restaurants and a cliff band that drops steeply to the Pacific, is one of her go-to sites. Two border collies approach with a young guy in tow. “Have you seen the coyote?” Kessler asks. “All the time,” the guy says. “It yells at us.” He plays a video on his phone of a coyote standing beside a log, framed by shrubs, barking. The border collies turn their heads, intrigued. Some people take on their dog’s appearance and mannerisms after enough years together — a pit bull of a man jogging his pit bull, a poodle in the lap of a prim, curly-haired old lady. Similarly, Kessler is thin, quick and hyper-attentive. She dresses in various shades of muted green to better blend with her surroundings: mossy jeans, fern-colored fleece, olive ball cap with a coyote standing just above the brim. A brown-gray ponytail hangs to the small of her back, resembling — as the name suggests — a tail. There is a surefire way to identify Kessler as human, though, and that’s the massive camera in its case, slung across her chest like a beefy camo-patterned infant. “I don’t have an encounter every time I come out, but if I do, I’ll easily get 600 photos,” she says. “My camera is my notebook. It records time, place, weather, behavior, everything.” Her images have been published in Bay Area magazines and shown at local museums and galleries, but they are first and foremost personal research tools. Recently, she’s been using them in conjunction with Google Maps to better understand what she calls “trekking” patterns –– how the coyotes navigate the city. Kessler’s obsession can be traced back to a seemingly random incident: In 2006, she cut her finger on a can of black beans and had to quit practicing the pedal harp for two hours each day, as was her habit at the time. One afternoon during her recovery, while walking her dog on Twin Peaks, a semi-wild ridge at the heart of the city, she happened upon a hunting coyote. Entranced by its behavior, she returned the next morning with her camera. Soon she had self-published a little album, Myca of Twin Peaks, and was feeling an entwined sense of wonder and responsibility –– an obligation to share her newfound appreciation of the city’s lesser-known denizens. Occasionally, coyotes in urban and suburban settings have attacked dogs and even people, but Kessler says that such antagonistic interactions are avoidable. She’s adamantly opposed to trapping and killing programs, and helped found a volunteer group –– Coyote Coexistence –– to educate the public about how to live alongside the species. (Rule number one: Keep your dog leashed.) “In every community, there’s one group that wants to kill them, one that wants to save them,” she says. Coyotes As Neighbors — the title of the 30-minute slideshow she produced for coyotecoexistence.com — is an apt summary of her hopeful vision. And now here comes one of those neighbors: Goggles. Kessler is on her feet in an instant, camera out, shutter clicking maniacally. Goggles, so named because his eyes are “a little puffy,” strikes me as more robust and handsome than previously described. Trotting along the far side of the fairway, he stops and ponders the ground. His head tilts. “Pay close attention,” Kessler whispers. “You might witness a pounce any second now; gophers and voles, that’s what he wants.” But the pounce never comes. For 15 minutes, we trail Goggles at a respectful distance of 50 feet. Then he turns, looks directly at us — click, click, click — and disappears into heavy brush. The afternoon dimming into evening, we wander the back nine, poking about in thickets, enjoying the exploration. Kessler recounts story after story as we stroll. Once, she observed snoozing siblings for 13 hours. (They stirred occasionally to harmonize with howling ambulance -sirens.) Another time, determined to travel through the night with a particularly welcoming coyote, she told her husband not to worry if she wasn’t back before sunrise. (The coyote ditched her earlier than expected.) She’s seen just about everything in the field, from coyotes that have been hit by cars to one that understood traffic signals and would wait patiently for the light to change before dashing across the street. Eventually, inevitably, I raise the obvious question: Why? Why would a woman with a master’s in art history and no formal biological training dedicate the prime of her retirement to the pursuit of an animal that many folks consider a pest, and that others say has no business living anywhere near a city? Returning to the fairway, we’re surprised by the sight of Goggles, hunting, exactly where we first spotted him. This time, he treats us to a number of acrobatic pounces, all unsuccessful. Kessler says that she usually heads home when she can no longer see to shoot — click, click, click — and both of us chuckle. If that were true, we’d have been out of here a half-hour ago. Minutes later, it’s full-on night, and Goggles is all but gone; I can just make him out curled up in a ball, five feet from a paved cart path. Kessler and I sit in silence, squinting into the dark, not quite ready to leave. “We could call it quits,” she says. “Or, if you’d like, we could play with my night-vision goggles.” She pulls what looks like a regular pair of binoculars from her backpack and hands them to me. In a flash, it’s daylight again, a weird pale key-lime sort of daylight. The fairway is a ghostly wash, with Goggles a coyote-shaped splotch of ink. The perspective is magical, as if I’ve been sucked through a portal and granted access to a secret San Francisco. “Here come some people,” Kessler says, excited and tense. “Keep your eye on him. See what he does.” I pan right, and five teenage girls stroll into view. They follow the cart path, heading directly toward Goggles, totally oblivious. He raises his head, just barely, and my chest tightens. Four, three, two steps away. The girls are closing in, chitchatting, near enough to feel a coyote’s wild breath on their ankles if only they were to remove their socks. Goggles flicks his ears and puts his chin back down on the ground. He knows they don’t know he’s there. He knows that this is his turf, his zone. He knows there’s no issue, no problem, no need to react.